MJ, 18 Apr 2011Wonderful spec! its a prototype of E7.cant wait to use it.Its not a E7, not even close. This phone was cancelled due to the sliding hinge problems and changed to N950. 1 GHz processor is good but atleast 12 mp camera and 4.5" display can make it perfect. Wonderful spec! its a prototype of E7.cant wait to use it. when r we gettin it? N950 specification- 3g and 4g,amoled plus lcd display,1080¡è640 resolutaion,4.3 inches,nokia cbd display,analog and live tv,scratch resistant oleophobic surface,multitouch input method,proximity sensor for auto turn off,accelerometer sensor for auto rotate,handwriting recognition,3.5mm audio jack with quad sterio speekar,full touchscreen,64gb memory and 64gb support micro sd card,1gb ram, 2gb rom,hsdpa-21.1mbps and hsupa-5.76mbps,wlan and wimax,bluetooth-3.1 and infrared,wifi-802.11b/g/n,usb 2.0,camera-16mp with 3x optical zoom,autofocus,dual led flash,superb xenon flash,torch,camera good sensor,geo tagging,face detection,1080p full video recording and playback,secondary camera 5mp with flash,meego os,1.66ghz intel atom dual core processer,aderno 305gpu,all msg, radio fm with rds,fm transister,ovi store 1,00,000 app,full flash player 10.2,you tube player,dolby digital sound,2500 mah battery,and other ex:dv,nc,etc. N9 is Amazing! Finally a 1Ghz processor!! When will Nokia release a smart phone with 2000GB (internal memory)? Enaholo, 11 Apr 2011Some people said the nokia n9 has 12 mega pix just like the n8, and some said its 5 mega pix. ... moreHere have this slap! There is no N9 get it! Finally nokia mannages to 1ghz processor plus 64gb storage..amazing!!! So will we see the N950 with a hard qwerty keyb like the never was n9 proto pic above! I really hope nokia decide to keep the hard keyb, biger buttons, plenty of space between them, & a space bar right in the centre where it needs to be. Will we see features like gyroscope, magnetometer, *NFC, IR was nice. I used Qtirreco to control sky+!! Also wifi g,N are very good, FM transmitter & hopefully bt 3.0. WSVGA 4.0" AMOLED 800x480 screen, 5MP or 8MP, can't see 12MP being in the N950 at all! resiistive or capacitive with stylus? All these exciting features to talk about. Even 720progessive you can do with 5MP, maybe it'll be an 8MP just to cut down on the processing less upscaling like on the n8. HD at last for linux. Hope we get customizable LED's again! Removable battery NOKIA!!!! Removable battery NOKIA!!! if i arent strssing this clear enough "REMOVABLE BATTERY NOKIA! !,, there that should do it" BATTERY needs to be pretty high milliamp hours!! One last word, LINUX the best forerver & always nothing else!!!!! I think this set is not good as n8. I think this is not good as n8. 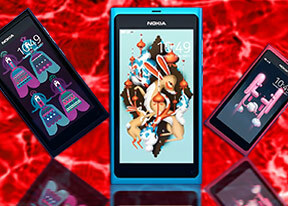 Nokia N9 is dead, now called Nokia N950..
Nokia has officially canned the MeeGo-powered Nokia N9. But fear not Nokia fanbois – if there’s any of you left – it has a replacement in the form of the Nokia N950. The Nokia N950, which is reported to be a follow up to 2009’s Nokia N900, will feature a MeeGo operating system, 1.2GHz processor and 768MB of RAM. The N950 is also expected to feature a 12-megapixel camera. That said, with all the Windows Phone 7 developments within Nokia it’s hard to really see anyone taking MeeGo seriously. After all, one analyst recently described it as the “biggest joke in tech”. Either way, it looks like Nokia – in true Nokia-style – is pressing on with the Nokia N950 regardless. We’re not expecting much to be honest, but it’ll no doubt be a big deal for all the tech-heads out there much like the Nokia N900 was, despite it poor mainstream reception. IT IS NOT N9!!! IT IS N950!!! No worries to the MeeGo fans because Nokia will still use MeeGo and windows Phone 7. Nokia, where is your X7 device?? Where is your Meego device?? We are soon in April, and you didn't announce any new smart phones! What's up with you?? I want to see the Meego phone already, and I am 100% sure that MANY people wants to see it as well!